At Christmas Decor by Cowleys, we have a wide selection of Christmas décor and lighting options to suit your home and boost holiday cheer. For many busy households, the holiday season is a time for family, friends, and creating memories that will last a lifetime. Unfortunately, sometimes the brightness of the season can be dimmed by the task of designing and installing Christmas lights, holiday displays, and other decorations. Decorating your home or business for the holiday season is not an easy task: it is very time consuming and can be dangerous climbing on ladders. Unpredictable weather conditions also can turn a tough job into a nightmare for homeowners. That’s why hundreds of families and business owners turn to us for help. Christmas Decor by Cowley's is your professional Christmas light installation service in New Jersey. Our decorating crews are fast, efficient, and use the best methods of decorating under all weather conditions. Cowleys Christmas Decor installation crews are professionally trained and use the utmost of care when decorating your home, without damaging moldings, roofing, or architectural elements. Christmas Decor® by Cowleys can magically turn your home into a Winter Wonderland. With specialized training, attention to detail, and the best holiday decorating products on the market, our crew will handle your holiday decorating from start to finish. Design Consultation – Cowleys custom creates a magnificent holiday display. Professional Installation – Cowleys provides property-friendly service. Proactive Maintenance & Service – Cowleys maintains your holiday decorations throughout the season including fixing any electrical, power or product issues that may arise. Additionally, we check & replace bulbs as needed. Take Down – Cowleys professionally boxes and labels your decorations. 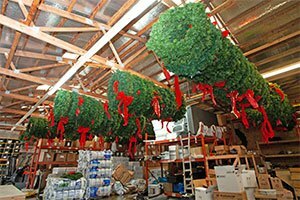 Storage – Cowleys safely stores your decorations at our facility. Plus, you don’t have to buy anything; all products are included in the service. You don’t have to worry about replacing lights, decorations or components. We handle every detail for you. This year, let Christmas Decor by Cowleys decorate for you so you can enjoy the holidays.